In 1985 Geoffrey Palmer, the attorney general and minister of justice, was the prime mover behind a white paper proposing a Bill of Rights as supreme law for New Zealand. The proposed Bill of Rights would have given judges the power to overturn laws that were seen to be inconsistent with the rights guaranteed in the bill. It would also have given legal recognition to Māori rights under the Treaty of Waitangi. The proposals were strongly attacked from a number of corners. Some argued that to give judges the power to strike out laws and determine the nature of human rights would undermine the power of the democratically elected Parliament. Māori leaders also argued that the bill might enable Parliament to amend the Treaty of Waitangi without the consent of Māori. The Labour government eventually withdrew its original proposals and put forward in their place the bill which became the New Zealand Bill of Rights Act 1990. 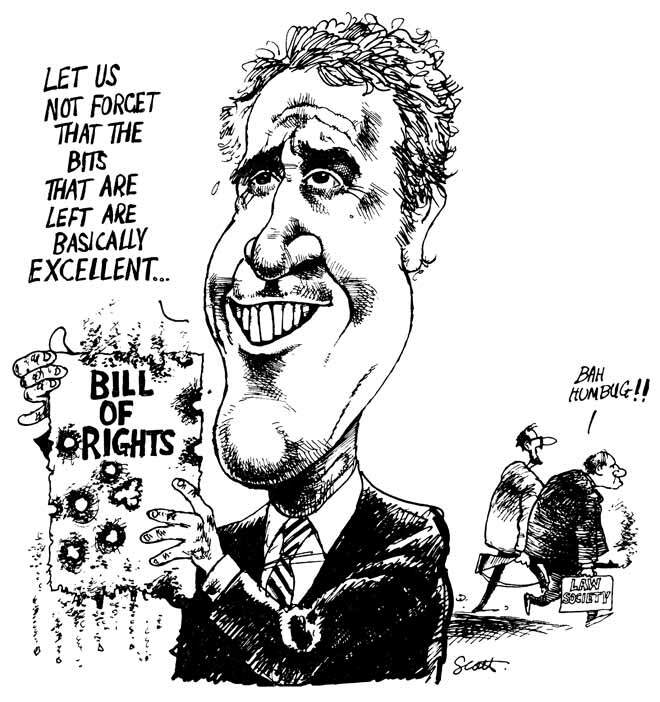 Tom Scott's 1986 cartoon depicts Palmer valiantly displaying a Bill of Rights shot full of holes.